Try the most exciting new experiences in Australia! The Jet Pack Experience is awesome, safe adventures and almost anyone can do it with minimal training. 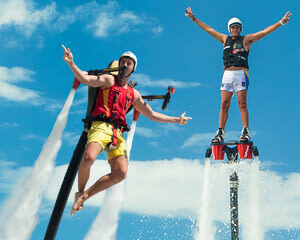 Experience one of the most thrilling new adventures available in Australia today - Jet Pack or Flyboard! Choose which adventure on the day. Jet Pack or Flyboard? Fly one or both! 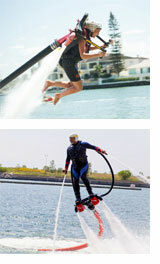 Or would you like to try Flyboarding! Minutes into your flight you will be comfortable enough to start reaching heights of up to 10 metres and able to perform figure eights, surface cruises and carve left and right in midair! On rare occasions, choice may be limited to one device (either Jet Pack or Flyboard) if mechanical breakdown occurs. You may choose to undertake the available device (either Jet Pack or Flyboard) or reschedule to attend on another later day if your choice is unavailable.